The recent development of the concept of organs on a chip opens the possibility of realistically studying human organs without the use of patients or animal testing. Professor Jaap den Toonder, who gave his inaugural lecture at TU/e on 20 June, even goes one step further: he intends to make microsystems in which multiple ‘organs’ are connected through ‘blood vessels’. That will for example allow precise investigation of how cancer spreads. This could eventually make the development of medical drug much cheaper and faster. TU/e is starting a special microfabrication lab to develop the required technology. Breast cancer usually spreads to the bone marrow, the brain or the lungs. But it is hard to follow exactly how this process works – it can’t be observed directly in the human body. This is exactly the question that Jaap den Toonder, professor of Microsystems, wants to help answer, together with other Dutch institutes. 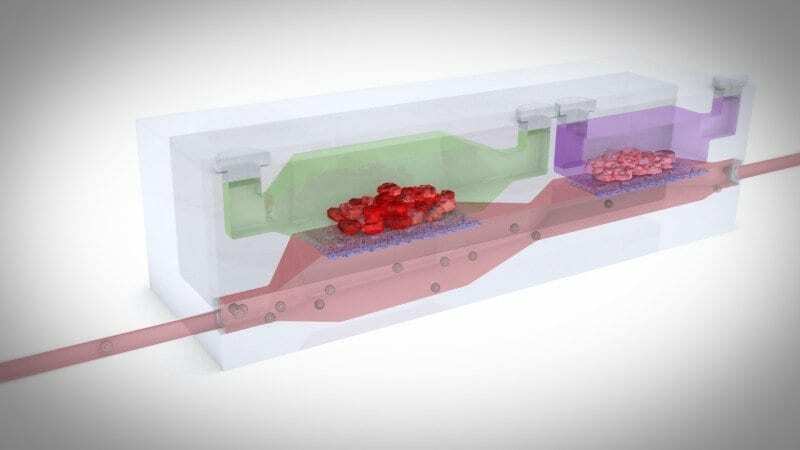 Den Toonder has been involved right from the start in the development of organs on a chip, together with other researchers including Donald Ingber of the Wyss Institute at Harvard. Systems of this kind can help to achieve a big reduction in the cost of developing medical drugs. Testing is now often carried out on human cells in Petri dishes, but these do not provide a realistic natural environment. In addition, animal tests are carried out, but these often react differently from humans. In addition, in animal tests it is not possible to observe in real-time exactly what is happening. And the fact that a medicine does not work as expected is often not discovered until it is actually tested on humans, by which time a lot of costly work may already have been done. By using a microsystem with organs on a chip, researchers will in the near future be able to perform tests much more quickly and realistically, without the need to use animals or human test subjects. March 21, 2019 - Microbe Motility Enhanced by Microbiome Metabolites in Colon Chip Technology NetworksTechnology Networks is an internationally recognised publisher that provides access to the latest scientific news, products, research, videos and posters. October 22, 2018 - Organs on a chip PharmaTimesThis new innovation could be a paradigm shift for clinical trials, but it's not without issues - Magazine Article - PharmaTimes.